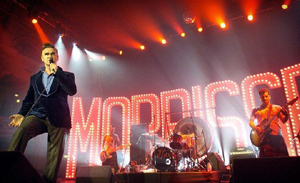 Morrissey spent the summer of 2004 promoting his newest release "You Are The Quarry" at festivals in the UK, continental Europe and even one date in the USA. He did three more festival dates after the above, Reading, Leeds and Edinburgh in England at the end of August, but these are covered in the next section because time-wise and setlist-wise they fit more with that mini-tour of England. A scheduled appearance at the Benicàssim festival in Spain was cancelled. Morrissey was also originally to be part of the Lollapalooza tour around North America in July and August, but the festival was cancelled due to poor ticket sales. He would instead tour North America on his own in September, October and November. Morrissey was asked to curate the 2004 edition of the Meltdown festival and he scheduled three gigs for himself, one at the beginning of the festival, and two at the end. Between those dates he booked many artists of very different styles, such as Sparks, Alan Bennett, the Ordinary Boys, the New York Dolls, Gene, etc. Morrissey carried over the tradition of coming on stage with a flower/plant hanging from his crotch zipper, as he had been doing on the earlier dates of this tour. He stopped doing this at some point into this leg though. Personnel: Boz Boorer (guitars), Gary Day (bass), Dean Butterworth (drums) and Mike Farrell (keyboards). Morrissey's other regular guitarist Alain Whyte was replaced from June 11 to July 11 by Lil' Barry Codgan. He himself was then replaced by Jesse Tobias from July 17 and into the following legs of this tour. Both replacements had the impressive task of learning Morrissey's live set in a matter of a few days only. It appears that Tobias was considered by concert attendees as a better replacement to Alain than Lil' Barry was. There was a big gong behind drummer Dean Butterworth, it was used by him at the end of certain songs. Dean's drum had the Attack logo on it. One of Boz's guitars was a replica of the Tommy Gun that Morrissey is seen holding on the cover of his "You Are The Quarry" album. Because these dates are festival appearances, the concept of support artist doesn't really apply. Only in Dublin and Chicago did Morrissey have real support acts. Damien Dempsey opened in Dublin while The Killers warmed up the audience in Chicago. 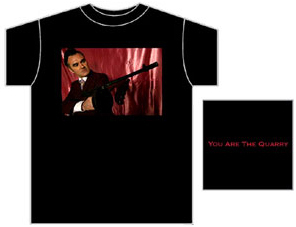 - Black t-shirt with the "You Are The Quarry" album artwork on front and title on back; � in the UK (view). 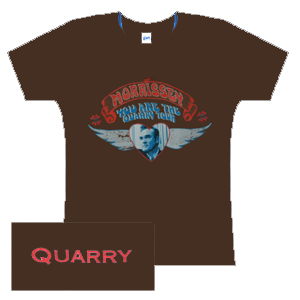 - Pale blue t-shirt with Morrissey in winged heart on front and 'Quarry' on back; � in the UK (view). - Tan version of the above; the text on the back may have been "Quarry" or "He Stole All Hearts Away"; � in the UK (view). - Tank top with "Morrissey" written in Old English font on front, small tommy gun logo and "You Are The Quarry" on the back; � in the UK. Sold in black or white variations. 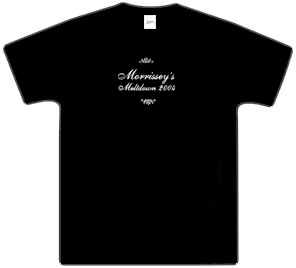 - Black 'Morrissey's Meltdown 2004' t-shirt (view). - At least one shirt sold at the Glastonbury Festival had Morrissey's name on the back amongst other artists playing the festival (image needed). 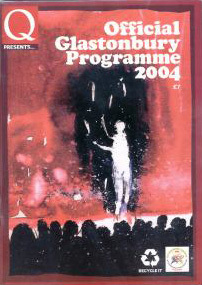 - The Glastonbury programme contained information on all artists playing the festival, including Morrissey (view). - A t-shirt sold at the Flippaut festival in Italy featured Morrissey's name on the front amongst names of other bands appearing there (image needed). - The programme sold at the Hultsfred Festival contained information on all artists playing the festival, including Morrissey (image needed). 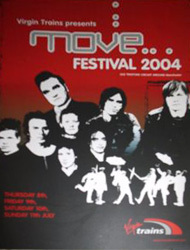 - The Move programme contained information on all artists playing the festival, including Morrissey (view). 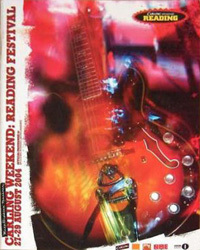 - The Reading programme contained information on all artists playing the festival, including Morrissey (view). The complete content is unknown, but it must have been similar to the intermission music from earlier on the tour. Sack's "Colorado Springs", Nancy Sinatra's "Let Me Kiss You" and some Brigitte Bardot are confirmed. Morrissey always entered stage at the end of Big Hard Excellent Fish's "Imperfect List". Frank Sinatra's "My Way" was always played after Morrissey's set as the fans exited. Nine very tall letters spelling out Morrissey's name, disposed in an arc at the back of the stage. The letters had light bulbs on them. The visual result was very impressive and reminiscent of Elvis' Comeback Special (view). In Spain the letters were not put up because the stage wasn't large enough. Morrissey had a fixed setlist of 17 songs for a majority of the dates from this part of the tour. Setlist-wise the highlight of these festival appearances was the live introduction of "Shakespeare's Sister". It had never been done by Morrissey in his solo sets. The solo arrangement of the song was very rock'n'roll with lots of piano. It contrasted with the generally slower pace of most of the setlist, hence its usual position near the top of the setlist. The setlist usually featured 8 tracks from the latest album "You Are The Quarry": "First Of The Gang To Die", "Irish Blood, English Heart", "I'm Not Sorry", "How Can Anybody Possibly Know How I Feel", "The World Is Full Of Crashing Bores", "All The Lazy Dykes", "Let Me Kiss You" and "I Have Forgiven Jesus". Earlier regular "I Like You" was completely but temporarily dropped. The setlist also featured "Everyday Is Like Sunday", "Such A Little Thing Makes Such A Big Difference" and "I Know It's Gonna Happen Someday" from Morrissey's solo back catalogue and "Rubber Ring", "The Headmaster Ritual", "Shakespeare's Sister" and "There Is A Light That Never Goes Out" from the Smiths days. The other two set regulars were future b-sides "Don't Make Fun Of Daddy's Voice" and "No One Can Hold A Candle To You". "Hairdresser On Fire" which had been a regular earlier on this tour as well as in 2002 was retired here after four shows. "America Is Not The World", "A Rush And A Push And The Land Is Ours", "Shoplifters Of The World Unite" and "Jack The Ripper" were played on very few occasions, perhaps to add variety when it was needed. The latter two titles would return later in the year, but not the two other ones. Here is the number of times each song was performed on this leg, in descending order of frequency. This is based on 12 concerts. Morrissey generally tends to update lyrics when he pulls an old song from his back catalogue, but because setlists on this leg of the You Are The Quarry tour featured a lot of new material, there are not as many changes to report here. The recent addition of a keyboard player to the line-up meant that Morrissey could play songs from his back catalogue that he could not have done as beautifully before, and he could improve the live arrangement of others. Songs like "A Rush And A Push And The Land Is Ours", "Such A Little Thing Makes Such A Big Difference" or "Rubber Ring" fall into the former category, while "Jack The Ripper" or "There Is A Light That Never Goes Out" fall into the latter. What was also noticeable on this tour was the slower pace of certain songs, particularly on tracks such as "The World Is Full Of Crashing Bores" or "A Rush And A Push And The Land Is Ours". Some people complained that this slower pace killed the momentum of the concert for them. All in all the most updated song was "Hairdresser On Fire". It usually started with "Where is London, so much for London" and the other occurrence of "here is London" was replaced with "so much for London" as well. Morrissey did the previously heard changes "can you tease me into an empty page of your diary", "psychologically shave me", "home of the crass, outrageous and free", "stoned around Sloane Square", "too busy to kiss me" and "when he said I'm gonna screw you, I felt quite happy for you". In the latter case he even sometimes took it to "I felt quite sorry for you". Morrissey usually replaced "you are repressed but you're remarkably dressed, is it real?" with "you are depressed, but you're remarkably dressed, and that's all you need" or "I am depressed, but I'm remarkably dressed, and that's all I need". There were many other minor changes, between "busy busy", "busy scissors" and "busy clippers", and between "supernaturally save me" and "supernaturally change me". The 2004 live arrangement of "Jack The Ripper" featured a new musical arrangement of the outro. As usual Morrissey dropped the song's final verse and replaced it with a repeat of the chorus. In 2004 this repeat of the chorus was over minimal music, almost accapella, and the audience would often sing along with Morrissey. The man slightly changed a line in that song to "you don't agree but you don't refuse me, I know you". In "Such A Little Thing Makes Such A Big Difference" he usually stuck to the studio version's "how I love all of the very simple things of life", but sometimes did the alternate "...complicated things of life". He also sometimes followed the line "most people keep their brains between their legs" with "I do! ", "thank God! ", "me too! ", "so do I! ", a growl or nothing at all. In "I Know It's Gonna Happen Someday" he stopped doing the alternate live change to "I know it's gonna someday to me". "Everyday Is Like Sunday" was segued from the first verse of a New York Dolls song called "Subway Train". 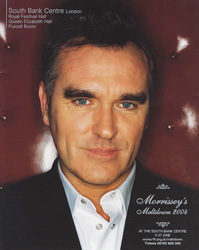 Many fans thought that the extra verse they heard came from Morrissey's "My Love Life" because the latter is musically very similar to, and probably inspired by that New York Dolls song. Morrissey was more conservative than usual with the changes in that title. The only remaining ones were "scratch on a postcard" and the ending of "...when you're all alone, when you're on your own". Instead of "please come, please come nuclear bomb" he went for the original studio version's "come, come nuclear bomb". In the song's intro "Subway Train" he sang "it isn't easy" instead of "it ain't easy". In "A Rush And A Push And The Land Is Ours" Morrissey changed lines to "just eighteen months ago" and "I'm just surprised to still be on my own". He also replaced "and I soon came home" with "so I came straight home" and sometimes reversed "I'd hate the strain of the pain" and "I'd hate the pain of the strain". At the end of the song he sang "my youth may be gone, but I'm still a young man" or "...a good man". "There Is A Light That Never Goes Out" was lyrically very faithful to the studio version. Surprisingly at this point in time Morrissey started to sing the chorus at the end of the song. He had only done this once at the very beginning of the Queen Is Dead tour in 1986, then never again, even in solo. In "The Headmaster Ritual" Morrissey changed "bruises bigger than dinner plates" to "bruises as big as dinner plates". Funnily enough, in an interview published shortly before the tour Johnny Marr mentioned that when the Smiths had recorded the song, he had had a discussion with Morrissey in which he told him that he should sing "as big as" instead of "bigger than". It seems that Morrissey finally took the advice, albeit 20 years later. In "Rubber Ring" Morrissey sang "a sad factor widely known", which is what he had originally written. He also sang "Good God! smother me Mother". The songs from the new album that had already been played live on the 2002 tour (so that's "First Of The Gang To Die", "The World Is Full Of Crashing Bores", "Irish Blood, English Heart" or "I Like You") were now done the same way they appeared on "You Are The Quarry". Having recorded them, Morrissey had now settled on definitive lyrics whereas in 2002 the songs slowly evolved as they were being broken into. However, on a few occasions in "Irish Blood, English Heart" he reverted to the original line "racist or racial". In "How Can Anybody Possibly Know How I Feel?" the change to "everybody look, see pain and turn away" was now more common than the original "everybody look, see pain and walk away". A line further into the song sounded like "as for you in your uniform, your totally smelly uniform", but Morrissey wasn't the one singing the word "totally", it was actually a sound sample of a man saying "we told you". In "I'm Not Sorry" he sometimes changed "when will this tired heart" to "when will this feeble heart" or "when will this cold heart". In "America Is Not The World" he changed the intentions of the song by replacing "and I love you I just wish you'd stay where you is" with "I once loved you but you wouldn't stay where you is", and at the end "I love you" to "I once loved you". The cover of Raymonde's "No One Can Hold A Candle To You" had yet to be recorded so Morrissey tried a few variations of some lines, some of which he would keep and others he would drop. He particularly alternated between "they stand on my hands, they stand on your hands", "they stand on my face, they stand on your face", "they stand on your head, they stand on my hands" and "they stand on your hands, they stand on my hands" but would finally settle on the latter when he recorded the song. At least once he changed "Am I Einstein or am I Frankenstein?" to "Am I Einstein or am I Gertrude Stein?" In "Don't Make Fun Of Daddy's Voice" Morrissey introduced the change from "something got stuck in his throat" to "somebody got stuck in his throat". This would be done more commonly on later tours. Video footage of "Irish Blood, English Heart", "Everyday Is Like Sunday", "First Of The Gang To Die", "I Have Forgiven Jesus" and "There Is A Light That Never Goes Out" from the Move Festival was included as bonus material on the official live DVD release "Who Put The M In Manchester?". "Glastonbury", a documentary on the legendary British festival, includes Morrissey performing "First Of The Gang To Die" at Glastonbury 2004. This was released to theaters and then on DVD in 2006. Thanks to various television broadcasts and quite a few video bootleggers, fans and collectors have a wealth of visual souvenirs from this stretch of the You Are The Quarry tour. None of the televised concerts featured the full setlist. The longest one is the 14-song television broadcast of the Hultsfred concert. It must be said however that an inferior webcast of the complete show is also out there for people interested in a full set. Then collectors can choose from seven songs from Glastonbury, four songs from the Move Festival, one song from the Roskilde Festival and one song from Norway's Quart Festival. Collectors should keep in mind that the four televised songs from the Move Festival are available on the official live DVD "Who Put The M In Manchester? ", albeit with different camera angles. Fans who don't mind audience recordings will be rewarded with quite a few options. Two different fanmade video bootlegs of the Move Festival and each of the three Meltdown gigs are out there, plus one recording of the Dublin concert. The best options are the Chris A recordings of the three Meltdown dates, particular the one for 25 June. The Dublin recording is probably the least interesting of the lot because the recorder was positioned near the stage where there was a lot of action, so it is quite shaky and often obstructed by the backs of other fans' heads. All dates from this leg of the tour are available on audio bootlegs, except for Bologna. Sound-wise the best options are the radio broadcasts of Dublin, Glastonbury, Roskilde, Kristiansand and Chicago. Of the lot only Roskilde features the full concert. The other recordings are about one-hour long, so they lack 3 to 6 songs each. Glastonbury and Chicago are the shortest broadcasts. Collectors of good quality recordings might also be interested in the audio of the 14-song Hultsfred television broadcast mentioned above, as well as the audio from the four televised songs from the Move Festival. The Fuengirola concert was broadcast in full, but the sound quality of the recordings in circulation is not that good, and the constant sports-style commentaries from the radio DJs between songs can be very annoying. Completists will want to get their hands on good audience recordings of the two latter Meltdown dates, the audio from a bootleg video of the first Meltdown date, audience recordings of Dublin and the Move Festival, and finally a partial audience recording of Chicago. Setlist-wise none of these dates really stand out from others. Most of the songs played on this tour are available on a good quality recordings. The rarely played "A Rush And A Push And The Land Is Ours", "America Is Not The World" and "Shoplifters Of The World Unite" are available on the commonly found radio recording of the Dublin concert while "Jack The Ripper" is found on the partial radio broadcast of Chicago.